Sweet Greetings to all of you! Its officially summer at Campbell's abode, Wohoo! 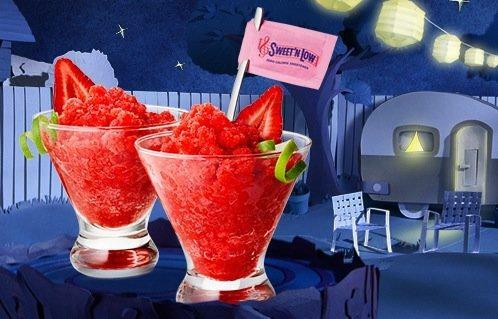 We are totally enjoying the hot summer this year by cooling it down with this awesome Strawberry Granita Freeze. Yum! why don't you grab something to drink and let's chat. I'm just excited to share my little story on how I came up with this delicious drink idea. I'm a member of Crowdtap for over 2 months now and loving it. What you do basically on the site is just simply participate on quick hits, challenges and mission. Then, you will get invites from crowdtap to try the product for FREE! yeah you heard it right totally free! Make sure to grab your spot quick and do short survey. Then, they'll notify you if your qualified for the product. Easy huh? I think so too. 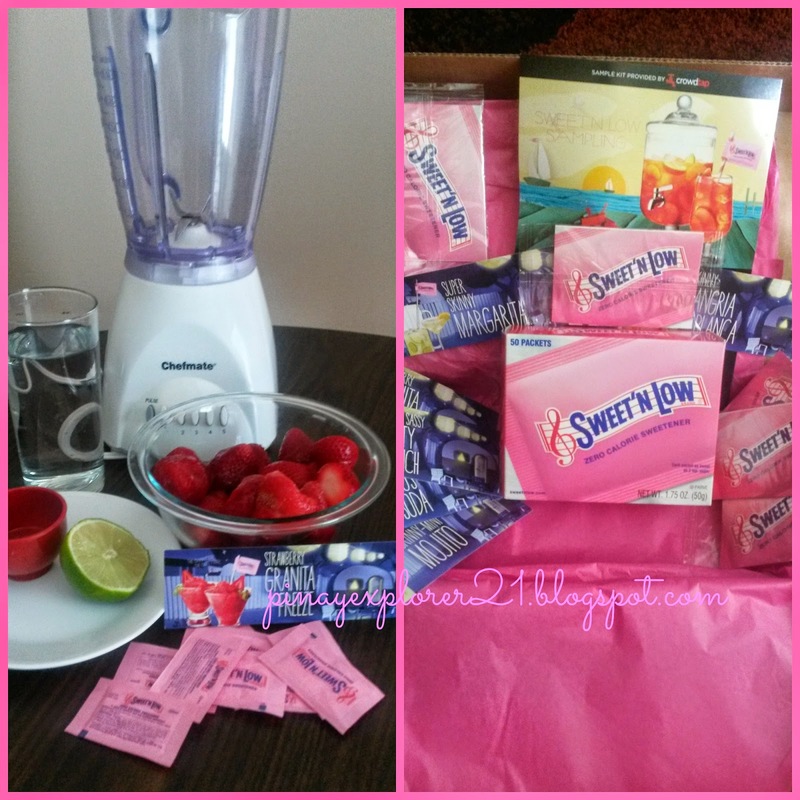 Last week, I got accepted to try this Sweet'Low calorie sweeter. The package arrived around 2-3 weeks but I think its quicker than that. 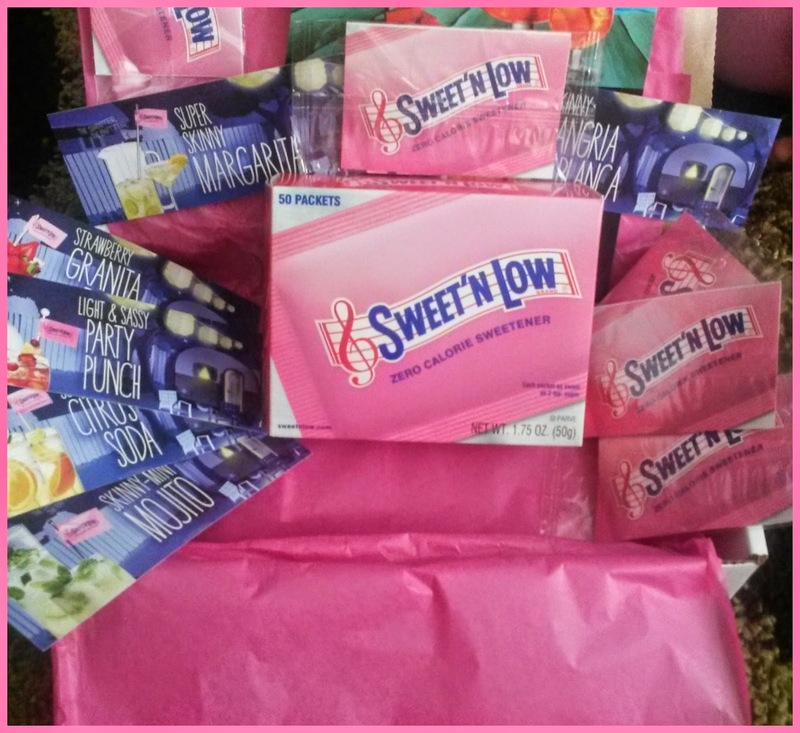 The package was filled with drink recipes, sweet'nlow zero calorie sweetener sample and coupons to share with friends, 1 package of 50 packets of sweet'n low wrapped very carefully with pink wrapping paper. See my snapshot below! Then all you have to do is submit some photos on your social media sites and report that you will find on crowdtap website. You also get a chance to win gift cards which is prrettty awesome!! Now that, you know where I get this delicious drink idea. 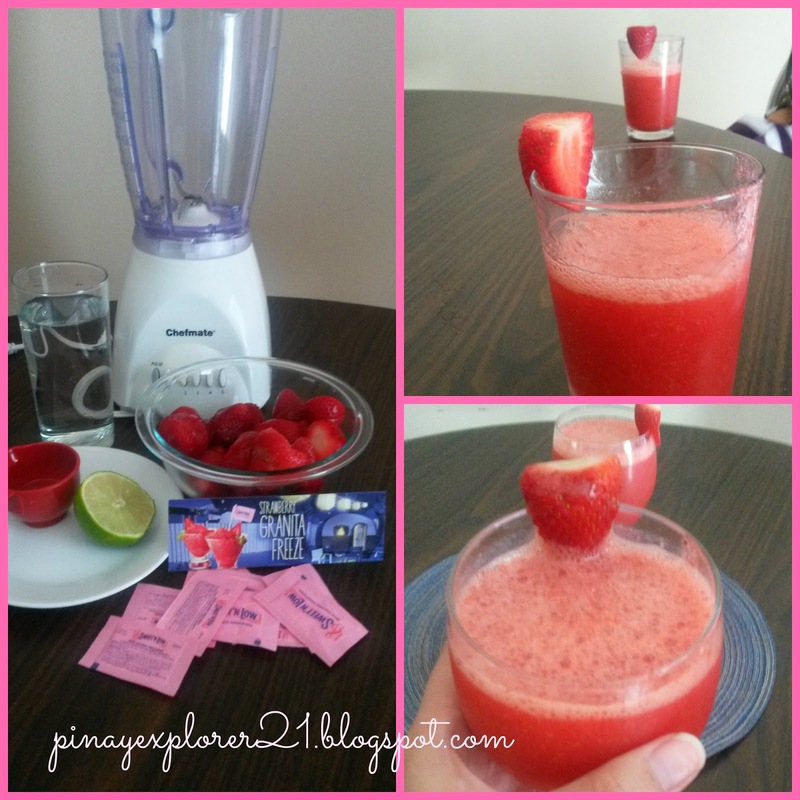 Lets talk about the main ingredients on the drink, The Strawberry! I always wanted to know more about strawberry even before and never really get a chance to dig deeper, but now that I have a blog, I'm kinda like a new person.. wohoo! etchuz! I do some research, read articles and share the knowledge that I learned to all of you. Let's start! "Strawberries have the common scientific name of Fragaria, but there are different suffixes for different varieties, such as Fragaria Vesca for wild strawberry, and Fragaria Orientalis for Eastern Strawberries. Isn't it fun to know some fact about your favorite fruit? Strawberry is probably my 8-10 favorite fruits but it surely a hit every summer. It's not only they make a really good pie filling but they are totally inexpensive on summer time! 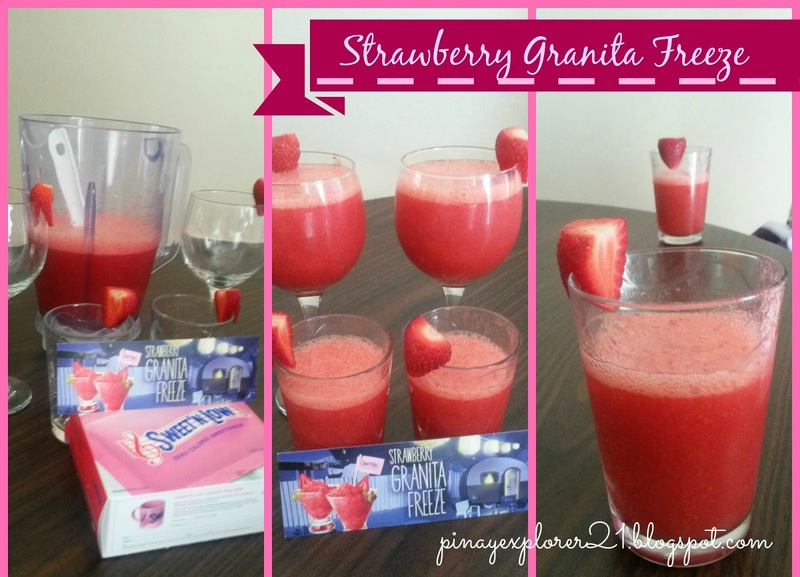 Grab some strawberry when your heading to the market this week and treat the whole town with this super easy and delicious Strawberry Granita Freeze.. Feeling hot and thirsty? Come on! lets make something to drink! in the blender container in that order. Cover it tightly ( make sure that the lid is snap and close). Blend 20-30 seconds or until slushy. Place frozen strawberries, water, lime juice, and Sweet’N Low® in 6-cup blender container in that order. Cover tightly (if blender lid doesn’t snap on securely, hold lid down with hand). Blend 20 to 30 seconds or until slushy, stopping blender to scrape down sides if necessary. Pour into 4 tall glasses. Garnish each glass with fresh strawberry. Looks yummy! I love strawberries but they are expensive here. Grab some when they're on sale. Its so inexpensive her lalo na pag summer. Thanks! That drink looks perfect for a hot summer day. !! In my part of the world, that is only possible with powdered strawberry drink. Looks refreshing. thanks for sharing! That is good for two things: to refresh one during the hot days (and nights) and to give an alternative drink that is low cal. Your post reminded me that I need to buy a new blender so my family and I could enjoy shakes at home again. My old one broke because of crushing ice cubes. Your strawberry drink looks delicious. Mine was broken last night! tsk, tsk. I'm going to buy new one sometime soon. :) Thanks! This perfect for hot weather. Too bad for us since price of strawberries here is too high. I wanna try this. Fresh strawberries though are expensive here. Happy 6th Anniversary, Sweetie- Updated!